Shopping for the vehicle that you’ll be driving for years to come should not be a chore or an exercise in frustration; at our Queens, NY, BMW dealership, it never is. 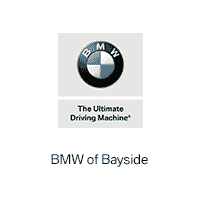 BMW of Bayside is proud to provide Empire State drivers like you with the quality automotive experience you deserve. It’s our goal to make sure that every luxury-car shopper drives off our lot inside a vehicle they’re happy with, whether it’s a model they’ve just purchased from us or one they brought in for repairs and maintenance. Our BMW dealership has a huge inventory of luxury vehicles for you to browse. Take a walk through our showroom or browse our BMW inventory online and you’ll see all of the hottest BMW vehicles cruising the streets and highways today, such as the BMW 3 Series sedan, BMW X5 SAV and BMW M4 convertible. We have new, pre-owned and certified pre-owned models for interested shoppers to choose from, plus pre-owned cars from other makes, all to provide you with enough variety to find exactly the car that’s right for your lifestyle. Stop by BMW of Bayside’s new car showroom today at 247-21 Northern Blvd, Douglaston, NY or BMW of Bayside’s pre-owned showroom located at 214-27 Northern Blvd, Bayside, NY! You can also come to our Service and Parts Center located at 266 East Shore Road, Great Neck, NY for all your auto repairs and maintenance. We want to make sure that you’re enjoying your vehicle safely and for many years to come. We have a team of talented BMW experts on staff, and we have the professional equipment and technologies required to make your auto service experience short and sweet. It doesn’t matter if you’ve come for a basic tire rotation or a comprehensive repair job: count on us to complete the task. If you want to buy a replacement windshield wiper, headlight, oil filter or any other car component, we can help you locate it. There are plenty of OEM BMW parts that you can buy, as well as accessories like floor mats and seat covers.